While we don't have anyone at the Melbourne International Auto Show, we can certainly admire from afar. For instance, we've been spending the last few minutes ogling the sweet sight lines on the new Coupe 60 concept car just revealed by the boys down under at Holden. It's meant to be a 60th anniversary present for Holden fans — a diamond annum of Holden's first all-Aussie car. The pillarless concept car is around 60 mm shorter than a VE sedan and sits on 21-inch center-lock alloy wheels with unique design Kumho high performance semi-slicks. Under the hood is a big 6.0-liter V8 — and inside, well, there's some pretty to go around there too. Check out the full release after the jump. GM Holden today marked the diamond anniversary of its first all Australian car by unveiling a stunning two-door performance thoroughbred called Coupe 60. Coupe 60 celebrates the six decades since GM Holden built the 48-215 at its Fishermans Bend plant in Port Melbourne, Victoria, and provides a glimpse of Holden's future directions in design, engineering and emerging engine technologies. 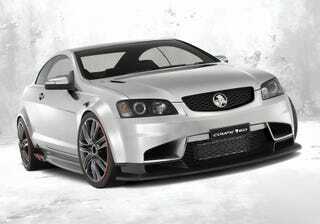 Exemplifying sports luxury, Coupe 60 is a pillarless concept car that explores the limits of Holden's current rear-wheel drive capabilities, combining racing looks and technology into a road going sportscar experience. Its sophisticated appearance is delivered through simple and powerful design, highlighted by the pillarless construction and V8 supercar inspired cockpit layout and side-exiting chambered exhaust system with billet alloy tips. Almost 60mm shorter than the VE sedan, and sitting on 21-inch centre-lock alloy wheels with unique design Kumho high performance semi-slick tyres, Coupe 60 captures all that's exciting about the Holden DNA. Other racing-derived enhancements include full flat under body, rear underbody air diffuser and functional rear deck-lid spoiler with unique designed LED tail lamps. The interior also has several unique features. They include one piece carbon fiber bucket seats (featuring leather and suede pad design) and a sports-inspired flat bottomed steering wheel with integrated shift light display and LCD sports instrument cluster. The high gloss carbon fiber carries through to doors and rear trim providing a contrast to the leather trimmed instrument panel and black suede trimmed pillars, headliners and parcel shelf. Details and accents are picked out with a distinctive red high shine leather on the seats and dark gunmetal finish and satin chrome on the consoles and doors. Front seats are adjustable fore and aft to allow easy access to the rear, with four-point race harness restraints for all seating positions. Under the bonnet is just as forward looking, with a 6.0 litre V8 engine incorporating the latest technologies such as active fuel management and calibrated for E85 ethanol fuel. Even the paint is a one-off. Called 'Diamond Silver' by Holden designers, it gives a liquid aluminium finish that almost slides off the bodywork. GM Holden Chairman and Managing Director Mark Reuss said, "Coupe 60 is Holden's 60th anniversary gift to its fans worldwide. "It highlights Holden's heritage of rear wheel drive performance whilst looking ahead to the potential offered by new technologies and materials. "This is a vehicle I know our designers would dearly love to see go into production, but for the moment it has to remain a concept only," he said. Project Designer Manager, Peter Hughes, said, "We were looking to mark the diamond anniversary with a car that captured the Holden DNA and took the current VE range to an exciting next step. "Even in the early stages of VE development, we knew there was a sensational coupe waiting to get out and the 60 th anniversary has given us the chance to explore that. "With Coupe 60 we think we have designed a car that has the potential to write another chapter in the book of Holden icons." Exterior mirrors with integral LED side markers. Unique interior details including air vents, column switches, gear shift knob and pedals. Details and accents are picked out with red high shine leather, a dark gunmetal finish and satin chrome.